The push to get Yuki Kawauchi to the Boston Marathon happened a year ago at a Red Sox game. Brett Larner, who serves as Kawauchi’s interpreter and manages a blog covering Japanese distance running, was taking in a game at Fenway Park with four-time Boston winner Bill Rodgers last April when Rodgers expressed his admiration for Kawauchi, an amateur from Kuki, Japan, known as the “citizen runner.” So Larner took a short video of Rodgers encouraging Kawauchi to compete for a title in Boston and sent it to the 31-year-old Kawauchi. Kawauchi responded within 30 minutes and said he would do it. Not only did Kawauchi win the men’s elite race in his Boston debut, finishing in 2 hours 15 minutes 58 seconds, but he also completed perhaps the greatest upset in the 122-year history of the race, surging over the final 2 miles in chilly, windy, and rainy conditions. “For me these are the best conditions possible,” he said a few minutes after crossing the finish line. Low temperatures, wind, and rain brought out a lot of unhappy faces along the 26.2-mile course that runs from Hopkinton to Boston. Although his time was the slowest for a winner since the 1976 race in 100-degree weather, Kawauchi said he has always run well in cold weather, including his outing in January at the Marshfield New Year’s Day Marathon when he won in sub-zero temperatures. He said the conditions on Monday played in his favor, acknowledging that a win in regular conditions would have been tougher to pull off. The victory, which saw Kawauchi chase down Geoffrey Kirui and erase the defending champion’s 1½-minute lead, only added to Kawauchi’s impressive résumé and reputation for being distance running’s self-coached iron man who competes in more than 10 marathons per year. And to Kawauchi, it was no coincidence that he became the first Japanese runner to win here since Toshihiko Seko in 1987, the same year Kawauchi was born. “I can’t help but feel the hand of faith in this,” he said. 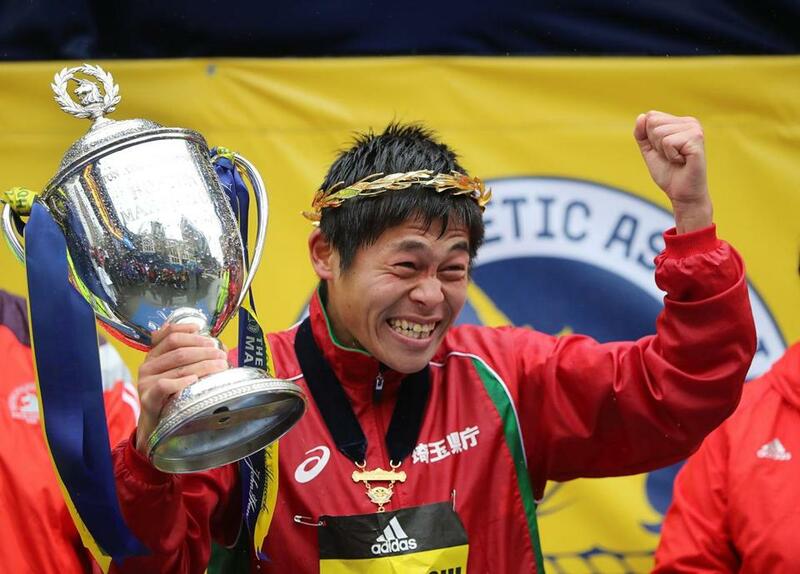 Yuki Kawauchi of Japan celebrates after winning the men’s race at the Boston Marathon. But even as that hand of faith pushed him past Kirui in Kenmore Square, Kawauchi didn’t realize he had taken the lead and he didn’t know it was Kirui, the defending world champion, he had passed. “I didn’t look to see who it was and I just kept focus on going forward, forward, forward, running my race and keep going,” he said. And even as he approached the finish line on Boylston Street, he wasn’t sure he would be the first across until race volunteers started waving him to the right side of the finish. “At the technical meeting, [race organizers] told us that the volunteers would wave winners to the right and everybody else to the left. They all started flagging me to the right and I was like, ‘OK, got it,’ ” said Kawauchi, who teared up upon winning. The watery eyes continued when the Japanese national anthem played and the country’s flag was raised near the finish line as the laurel wreath rested upon Kawauchi’s head. “It touched me very deeply,” he said of hearing the anthem. For the man who chooses to compete so frequently in marathons — he holds the world record for sub-2:20 marathons with 79 and uses the races to log quality long runs — Kawauchi will not take much time, if any, to rest. Boston’s newest champion, who looked spry during the news conference Monday afternoon, has designs on going for a training run on Tuesday. And he has plenty of work to do back at his day job, where he works in the administration office of a high school. “This year the high school is celebrating its 100th anniversary, so I’ve been quite busy writing the commemorative magazine for that,” he said. And of all the marathons he has run and of all the places this sport has taken him, it was here, these spectators and avid Boston fans, that left an impression on him.